I think one of the reasons that I love the summer so much is because fresh berries are everywhere, and they are FINALLY reasonably priced! No more will I pay $5 for a pint of mediocre berries....In fact last week, Trader Joe's had a giant pound sized box of blueberries on sale for $2.99! I had to purchase, since I've been enjoying my morning yogurt and granola with tons and tons of blueberries....But, after I got home, I realized. The BF is gone this weekend, so he won't be having them in his cereal...I had better do something special with my ample berry bounty before they spoil! I almost never bake, and rarely keep sweets or baked goods in the house, so I decided to treat my frequent gym attendance with a little baking...and try my hand at a free-form blueberry tart....which henceforth will be referred to as a gallete. (Gallete sounds much more sophisticated than 'lazy-man-tart'). Now, one of the reasons I don't often bake, is because I don't get enough opportunity to be creative. Baking to me, means ratios, measuring....exact science...bleck! So when I want to put a quick desert I employ the genius that is the frozen puff pastry. By using puff pastry, this dessert becomes so quick to assemble that it could easily be made on a weeknight. It's so easy! In fact, since the puffy pastry is already frozen, I imagine you could assemble this tart, freeze it, and then pop it in the oven up to a week or so later. Or bake it off while you're eating dinner. There is a lot of lemon in this gallette. 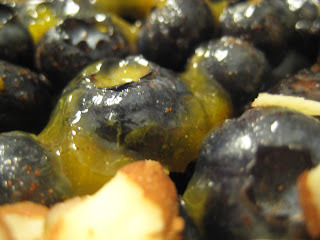 I really love the way that lemon and blueberry mix together, and it gets flavor from the juice, as well as the zest. Thaw puff pastry according to package instructions. While thawing, mix in a large bowl the blueberries through lemon zest. Once pastry is thawed, preheat your oven to 400. 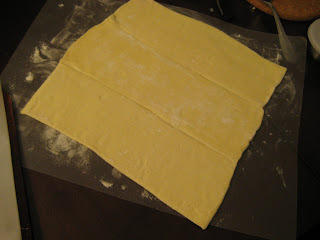 Dust your work surface with flour, then unfold the sheet of puff pastry on the flour. Use a floured rolling pin to smush out the seams of the pastry. This only takes a minute - do not overwork the dough! 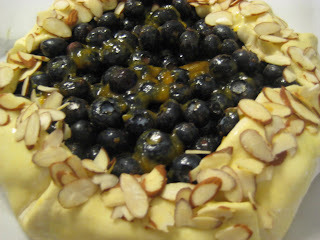 Once the dough is rolled out, spoon the blueberry mixture into the center of the dough, leaving a 2-3 inch border around the edges of the pastry sheet. Fold the corners first....take the pointy bit of the corner, and fold it toward the center....tuck the point under. Once all the corners are folded over the berries, fold the remaining bits of dough over the berries. Crimp everything together. Remember, this is supposed to be a rustic tart, so no need to be a perfectionist. ***EDITED***I just thought I should make mention that this was delicious, and the perfect desert for the summertime. 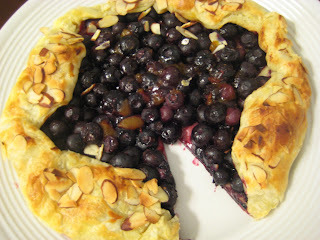 It was pretty quick, and the fresh fruit and flaky pastry made it very light and delicious. Give it a try! And? was it as delicious as you hoped?! sounds pretty awesome! I have been having a very difficult time doing things with the currents that I've been getting. omg alicia this post and the peach pie post are making me salivate! im so proud of you:) everything looks so delicious and your postings make me laugh because i can totally hear you talking about this stuff in person. at some point soon i WILL learn how to bake like you. looking forward to more baking posts for apple season! i love some warm apple crisp in the fall!